NASRDA, Nigeria’s National Space Research and Development Agency has made a partial solar eclipse occurrence prediction for different part of Nigeria on Sunday November 3rd, 2013. 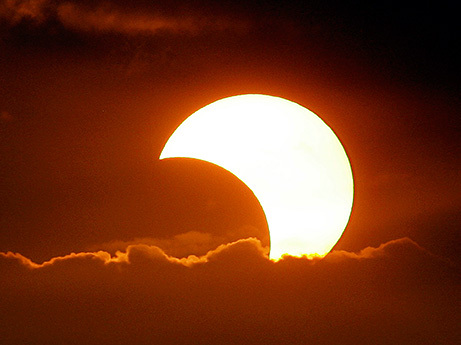 According to Professor Seidu Mohammed, the DG of the agency, eclipse is an astronomical event that occurs when an astronomical object is temporarily obscured. This occurs either by passing into the shadow of another body or by having another body pass between it and the viewer as seen from the earth. Mohammed advised Nigerians not to panic unnecessarily as nothing untoward would happen on that day. “These things are natural phenomena; Nigerians should not be afraid; the agency has responsibility to the nation, hence the reason for the early warning signal,” he said. Mohammed said that the partial eclipse would not affect the airspace but advised Nigerians not to think that the world would come to an end because of the occurrence. Prof. Opara Fidelis, Director, Centre for Basic Space Science,said that different parts of the country would witness the eclipse at different times of the day. He said that for instance, Abuja would witness it at 1p.m.,Lagos, 12:30 p m.; Kano, 1.07 p m. and Enugu, 1.04 p.m.
Fidelis, however, advised Nigerians to wear sunglasses to view the occurrence, adding that the glasses would protect their eyes from damage that might arise. Meanwhile, the NASDRA director-general said that the agency would provide such glasses for some Nigerians, especially children and selected Nigerians. He said that the entire African continent would be affected by the partial eclipse, while some other parts of the world would witness total eclipse. Mohammed urged Nigerians to go about their normal businesses as such occurrences happened occasionally. The same occurrence is expected in April 2014, March 2015 and Sept 2016.